Wichita Northwest picked up a momentum-building win last week by knocking off Class 5A defending champion Bishop Carroll 31-24. It was the Grizzlies first win over Carroll in ten years. Northwest will look to follow up that big win by beating Kapaun Mount Carmel this week. A Grizzlies win would likely put them in the driver’s seat in the Greater Wichita Athletic League. Coach Steve Martin has size on the offensive line and welcomes the return of quarterback Kevin Folsom. Folsom suffered a season-ending ankle injury in a Week 5 win over Wichita West last year. His return on Friday was a successful one. Folsom passed for 225 yards and a touchdown and added 115 yards rushing and another score. His 3-yard touchdown pass with around 20 seconds remaining in the second quarter gave the Grizzlies a 17-14 lead at the intermission. The teams traded touchdowns in the third quarter with Northwest’s Jahlyl Rounds giving the Grizzlies a 24-21 lead with a 28-yard touchdown run. Bishop Carroll eventually added a ield goal to pull even early in the fourth quarter. Rounds would put the Grizzlies up for good with a short touchdown run with 2:25 remaining in the game. Rounds finished with 79 yards rushing to go along with his two touchdowns. He rushed for 516 yards and eight scores as a sophomore last season. Kapaun Mt. Carmel opened the season with a 35-20 win over Wichita East. The Crusaders jumped out to a 14-0 lead in the first quarter on a Brock Monty touchdown pass to Colter Hullings and a Alexander Norris touchdown run. Wichita East eventually tied game with a pair of touchdown passes before Maleak Puritty gave Kapaun the lead for good with a 55-yard interception return for a touchdown. Monty hooked up with Hullings again before halftime to pad the Crusader lead to 28-14. Monty added a 1-yard touchdown run in the third quarter and finished with 184 passing yards. Kapaun got a big night from Norris who rushed for 273 yards and a score on 14 carries. Wichita Northwest has won nine of last 11 games versus Kapaun with the Crusaders’ wins coming more recently in 2013 and 2010. Look for Northwest to ride the momentum of their win over Carroll to a 2-0 start to the season. A season ago, Holton entered a Week 2 match-up with Maize South trying to avoid an 0-2 start to the season. After a Week 1 18-7 loss to Silver Lake, Brooks Barta’s Wildcats responded by jumping out to a 20-0 lead en route to a 40-21 victory over the Mavericks. Holton led the game 40-7 in the third quarter. This week, the Wildcats will again be trying to avoid an 0-2 start after a 23-22 overtime loss to Silver Lake last week. Maize South will host Holton on Friday night. Holton rushed for 306 yards against Silver Lake, but the Wildcats needed a 27-yard field goal from Arturo Revels with 1:09 remaining to tie the game at 16. The game eventually went into overtime where Silver Lake scored first to take a 23-16 lead. Spencer Baum scored from five yards out on the Wildcats’ possession to pull Holton to within 23-22, but Reveles' PAT sailed wide left allowing Silver Lake to survive. Holton lost 2014 leading rusher Indie Allen to graduation and used multiple backs in their rushing attack against Silver Lake last week. The rushing production was spread around with Baum’s 88 yards, Justin Rieschick’s 82 yards, Will Wright’s 73 yards, and Justin Pool’s 51 yards. Baum rushed for two of Holton’s touchdowns and caught a 41-yard touchdown on a halfback pass from Justin pool. Rieschick rushed for three first-half touchdowns in Holton’s win over Maize South last season. Maize South opened the season with a 41-34 win over fellow Ark Valley Chisolm Trial League member Goddard. The Mavericks’ offense relies on talented senior quarterback Korie Frausto. Frausto had an exceptional 2014 season rushing for 887 yards, passing for 1,219 yards, and combining for 32 total touchdowns. Frausto has received offers from Air Force, Southeast Missouri State, and Holy Cross. Frausto has the benefit of 6-foot-5, 305-pound Jeremy Luck blocking for him up front. Coach Brent Pfeifer has built the young Maize South program on defense. Pfeifer has traditionally placed the Mavericks’ best athletes on that side of ball, but Maize South graduated ten starters a season ago. A.J. Nardi is the lone returning starter and has moved from defensive end to linebacker. In the Week 1 win over Goddard, Maize South surrendered 278 yards rushing to the Lions and another 141 yards passing. The Maverick defense will need to be better against the run against Holton on Friday night. It’s early but this game will likely decide the East Division title in the Central Kansas League. Halstead rolled over Haven in Week 1, 48-6. The Dragons led 42-0 at the end of the third quarter and rushed for 366 yards in the game. Halstead’s standout backfield of seniors Eli McKee and Blake Beckett each had an impressive season debut. Beckett rushed eight times for 187 yards and two scores. McKee collected five carries for 81 yards and two TDs. McKee also completed 3 of 4 passes for 30 yards. Beckett paced the defense with eight tackles, including two for loss. Hesston coach Clint Rider led the Swathers to 8-2 and 10-1 marks the past two seasons. Hesston enjoyed standout performers in their backfield with Ryan Schadler two years ago and Grant Raleigh last season. 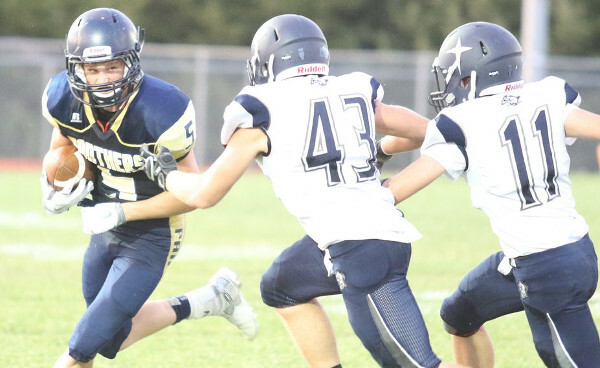 Although the Swather defense lacks experience with the top seven tacklers graduating last season, Hesston opened the season with a 35-0 win against Smoky Valley. Hesston is now 8-2 versus Smoky Valley in the past ten meetings, including seven straight wins. Hesston has shutout Smoky Valley three times in the last five years. On offense, converted wide receiver Zach Esau threw touchdown passes to three different receivers in the win. Alex Hostetler and Parker Roth each rushed for touchdown as Hesston built a 14-0 lead in the first quarter. Hesston has an 8-1 edge in the last nine games in the series with Halstead. That edge includes victories of 42-14 and 20-0 in each of the last two seasons. Halstead’s only victory in the last nine meetings was a 32-26 victory in 2012. Friday’s game is going to be similar, but Halstead’s rushing attack is going to be too much for Hesston’s inexperienced defense. These two Mid-Continent League rivals each delivered big victories to open the season. Norton led Ellis 47-0 after three quarters en route to a 54-14 victory, while Phillipsburg shutout Thomas More Prep, 35-0. Norton has multiple standouts, including sophomore quarterback Jace Ruder, junior lineman Jacob Green, senior fullback Jordan Dole and senior all-purpose threat Gavin Lively. Against Ellis, Ruder completed 7 of 13 passes for 216 yards with three scores against no interceptions. Ruder also rushed for 50 yards and two TDs on only three attempts. Statistically, Lively’s performance last week was one of the best by any player in Kansas. He rushed 12 times for 178 yards and two scores. Lively also caught three passes for 136 yards and two scores and added 50 yards on special teams. Green had six tackles, including four for loss. Phillipsburg overcame several injuries to key players and uncertainty at the quarterback position, to steadily pull away from the Monarchs. Senior running back Nate Prewitt remains out until mid-October because of a knee injury suffered in an offseason combine. Senior lineman Kian Stegmaier is not expected to play because of a knee injury. The Panthers used two quarterbacks and coach J.B. Covington said that will occur again Friday. This rivalry is typically close and low scoring. The last three matchups have been 20-7, 20-16 and 34-7 scores. Eight of the last 11 meetings are within 16 points. Norton won by 27 last season, and the Bluejays will win again Friday. This Wheat State League showdown will serve as a big measuring stick for two teams looking to make a deep run in 8-man, Division I. Last season, this was a wild, 96-46, Wakefield victory. Running back Zack Melius tied the eight-man state record for touchdowns and points in a single game with his 327 rushing yards, nine rushing touchdowns, 50 receiving yards, and two receiving touchdowns. Melius earned all-state honors after finishing with 1,530 yards on the ground and 33 touchdowns last season. Wakefield opened with a 54-8 victory against Blue Valley Randolph and has scored at least 48 points in all but one game in the past two seasons. Melius paces the high-octane Bomber offense that opened to a 32-8 halftime lead. Solomon is under new leadership after a 4-5 year last fall. Justin Coup took over the superintendent position and resigned coaching duties and his good friend, Steve Tiernan, took over the program. Tiernan has previously won state championships at Baileyville B&B and Osborne and went 10-2 with the Bulldogs last season. The Gorillas have had some defensive issues in recent seasons, including allowing 46 points a contest last fall. Solomon defeated Centre-Lost Springs, 52-0, in a game called at halftime last week. In 2014, Solomon opened with a 62-36 victory versus Centre. Senior quarterback Jake Tiernan, in his fourth year as a starter, completed all three of his passes for 62 yards and a score, and rushed two times for 96 yards and a TD. Senior Zach Neilson collected three carries for 68 yards and a score, and senior Kord Hilbert carried four times for 52 yards and two TDs. In the last 10 years, Solomon is substantially better at home, winning more than 55 percent of its home games versus a sub-.500 road record. This game is normally very high scoring. In 2013, Solomon won, 74-52. The winning team has tallied at least 40 points since the squads started playing consistently in 2010. Solomon is several notches better with the Tiernans and an improved team and could win this game. However, Wakefield and Melius have enough to pull out another high scoring contest. Oberlin-Decatur Com. (1-0) at 8M-II No. 2 Sharon Springs-Wallace Co. (1-0) – Wallace Co.